"The Jesus Discovery" is a follow-up to "The Jesus Family Tomb" (Jacobovici and Pellegrino). The current book is by James Tabor and Simcha Jacobovici -- different authors, but still receiving a similar treatment, since Tabor was involved in the investigations in the earlier book. "The Jesus Discovery" is the tale of investigations of a tomb very near the original Talpiot tomb, which they call the "Patio tomb". The original Talpiot tomb is now termed the "Garden" tomb, but this second tomb is deemed the "Patio" tomb (because it's underneath a patio).It's helpful, but not essential, to have already read the earlier book on the "Garden" tomb. It is well written and is quite accessible, while also going into some considerable depth to explain both the history of the whole controversy and explain the scholarship and research backing it up, so you get a review of all the evidence relating to their previous investigation of the Garden tomb. To cut to the chase, it appears that while the investigation of the Garden tomb suggested this may well have been the tomb of the historical Jesus and some of his family, the investigation of the Patio tomb essentially seals the case. In doing the investigation of the Patio tomb, the researchers did not actually do any physical excavation. The entire research is done by a camera manipulated by a long robot arm which was inserted into the tomb. So the tomb was, and remains, undisturbed.What they find is a tomb with clearly Christian symbols speaking of and describing the resurrection. Very important here is the distinction which is made between the physical resuscitation of a corpse, and spiritual resurrection. A spiritual resurrection means the person's essence survives, even though their original body is dead and decaying. This is the original idea of resurrection envisioned by Paul and shared, ironically, by the Jewish Christians, who later became Paul's bitterest opponents in the early church. The analogy given in the book is very convincing. Suppose that historians many centuries from now discover the graves of a George, John, and Paul. Could this be the Beatles? Well, the names were common. But then suppose that there is further identification of a nearby grave of a Ringo (an uncommon name) and that the father of one of them is also correctly identified on the gravestone. That's the analogy of the "Garden" tomb. But then suppose nearby we find a monument to the Beatles, celebrating their role in rock history. That's the analogy of the "Patio" tomb. Since both the Garden and the Patio tomb were probably owned by the same family, the evidence becomes very strong that this is the tomb of the Jesus known as the founder of Christianity. One interesting feature is the treatment of the James ossuary, which they now think is not the "missing" 10th tomb, but rather is an 11th tomb, perhaps looted many centuries ago and just recently surfacing on the antiquities market. The patina of the tomb clearly matches that of other ossuaries in the Garden tomb.The book clearly anticipates major objections, discusses Jesus' wife and children, as well as going over key objections to the thesis. So if you are curious about this and want to understand what the researchers have found from the horse's mouth, this book is indispensable.One minor criticism: contrary to the author's suggestions, I do not think you can draw conclusions about the Essenes or their influence on Jesus, based on the Dead Sea Scrolls. The Dead Sea Scrolls community may represent some Essenes, but there were evidently many different Essene communities, some with wildly different views, as Hippolytus (3rd century) says. The Essenes of Philo (a pacifist sect, which refused the use of slaves) are clearly very different from the Essenes of the Dead Sea Scrolls (a violent group believing in war and slavery). So before making grandiose suggestions about the Essenes and Jesus, we need to ask, "which Essenes?" There've been claims of actual physical evidence of the existence of members of Jesus' family since three ossuary tombs to the south of Jerusalem were exposed by construction workers in 1980. This, the third and most recent of the books I've read on the subject, goes so far as to link the three, their contents and a looted ossuary which may have contained the remains of Jesus' older brother, James, all together, suggesting that now we have the ossuaries, and some of the actual bones, of not only Jesus' mother and some of his siblings, but also of his wife and their son.In part this book tells the story of the original discoveries and subsequent investigations, in part it attempts to reconstruct the character of Jesus' family and of the Jewish-Christian community in Palestine prior to 70 C.E., focusing especially on their beliefs as regards resurrection. While I found this to be a respectable, albeit popular, treatment of the subject, I was somewhat taken aback by the arguments concerning resurrection beliefs in the early community. Here author Tabor seemed to be adding something extraneous to the evidence, presenting instead his own conviction that the early community didn't believe that either physical or spiritual resurrection occurred in time. While his arguments in this regard are worthy of consideration, they don't really pertain to the archaeological discoveries he discusses. I have followed the works of Tabor and Jacobovici for some years now and receive regular communications from their websites and have read previous publications from them as well as Shimon Gibson. My interest in the historical Jesus goes back many decades as does my abhorrence of many orthodox religions. 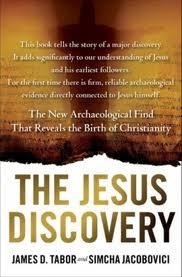 Therefore my review of 'The Jesus Discovery' may not be altogether unbiased. Although I am a little late in getting around to reading this book, it was first published in 2012, I have followed the developments in the research on the Talpiot tombs mainly through James Tabor's website.Tabor and Jacobovici both hail the historical and archaeological significance of both the 'garden or Jesus' and the 'patio' tombs as well as the 'James son of Joseph brother of Jesus' ossuary that was acquired by Oded Golan in the 1970's.However rather than celebrating what was gained by these discoveries, I can only mourn at what has been lost to history and science (a third tomb was completely obliterated at the Talpiot site by builder's use of dynamite) as a result of the casual procedures of the initial archaeological team from the Israel Antiquities Authority and the reburial of tomb remains by Orthodox Jews.What could have been the 'greatest story ever re-told' providing a treasure trove of scientific data on the direct family of Jesus involving study of bones and DNA links as well as facial reconstructions, not to mention the seismic repercussions in the houses of the holy. What a five star read this book would have been then!I am reminded of the finding under a car park in Leicester of the bones of a king, dead for over four hundred years, revealing his scoliosis and providing a whole range of scientific information about the nature of his death, his facial features, his DNA, even his diet. Of course, if he had been interred in Westminster Abbey all these secrets of Richard III would have been kept forever by stupid Christian belief. ‘Good history is never the enemy of informed faith.’ Seems true enough to me but for many Christians the physical resurrection of Jesus is an essential principle of their religion. ‘The Jesus Discovery’ would be a difficult read for these followers as it suggests that if such a resurrection did take place, it would have been of the spiritual, astral form of Jesus, a visionary experience for his disciples.I was raised as a Catholic, but never felt at home amidst all the dogma, even as a small child. I left the Catholic Church, mentally, when I was 13, but was still forced to be physically present at endless masses, benedictions etc. all of which gave me time to study the Bible. I discovered that the gospels of the New Testament were not one unified story and that the actual teachings of Jesus appeared to differ dramatically from the vengeful Jehovah of the Old Testament and also from the teachings of the Catholic Church. All fascinating. I went off on my own path but retained a strong interest in the historical Jesus. Did he exist? If so, what actually happened 2,000 years ago? ‘The Jesus Discovery’ provides some possible answers.James D. Tabor and Simcha Jacobovici approach their subject with sensitivity and respect. ‘The Jesus Discovery’ gives a very clear and readable account of their investigations into a sealed tomb dated to the first century CE (AD under the old system). I was amazed by the discovery of the ‘sign of Jonah’ on one of the ossuaries contained inside the tomb. For me, this suggests that the early followers of Jesus believed in direct mystical inner experience, raising their consciousness to find enlightenment, exactly matching a ‘visionary’ resurrection. There are further fascinating discoveries of great interest to anyone, like me, who wants to find out about the lives and beliefs of the early Christians. I appreciated the thorough research that the authors put into this book and their non sensational approach. A must read for all truth seekers. With my beginning stages of Young-onset dementia, I am doing good to remember the fact that I read a book, let alone be able to articulate my past thoughts about it. I will try to find the book & refresh my thoughts, then remember to come back here and document them. The book discusses two tombs, the Patio Tomb and the Garden Tomb which, the author believes, contain the skeletal remains of Jesus, Mary and other members of his family. Jude son of Jesus is skeletal find.The book discusses how bones were put into an ossuary, a stone box. The book goes into detail how how bodies were put into tombs, how they underwent natural decay and how the bones were then gathered up and put into the stone structures, sometimes with the name of the person on the outside. The persons that could have been put into a Jesus burial tomb included Jesus, Joseph, Mary (his mother), his brothers (James, Joses, Simon and Judas) and his sisters (Salome and Mary), Mary Magdalene (his wife) and any sons and daughters they might have had. This is not saying they were all buried there but they are the reasonable possibilities for persons being buried in the Jesus tomb. What is the most interesting material in the book, though, is the process of how tombs are found and how they are explored. Some can be entered by an archaeologist but some can only be accessed by using a remote-control camera down a shaft. There can also be a problem with ultra-orthodox Jews who object to anyone going into a tomb, and conservative Christians who are utterly opposed to any archaeologist who says they have found the remains of Jesus and his relatives including any hint of a marriage with Mary Magdalene. There is also a good bit about the various scientific tests that are done on anything found to determine just what it is and who it might have been used for. The book also adds how the Jewish government gets involved in any explorations and how they can confiscate anything found. It also covers how there is a huge warehouse full of such burial boxes.Whether or not a person accepts the author's contention that the bones of Jesus and others have been found the book still is fascinating as to the archaeological explorations are carried out, the tests that are done and problems that can be encountered with people opposing any such digs. I approached this book backwards, starting with the scholarly debate that followed the book and Tabor's and Jacobovici's claims. The various articles, blog posts, and rich commentary from the various scholars who have investigated the claims are interesting and generally unsupportive of T's & J's claims. So I began reading this book believing that T & J were stretching the evidence about as far as it could go, such that their main points might fall into the category of, "Well, I suppose that's possible, but highly unlikely." After reading this book, however, I think much of the scholarly debate is stretching the evidence further than T & J, and I would put T's & J's claims safely into the "plausible" category. Certainly not "case closed," and perhaps only bordering on "likely," but surely better than any of the scholarly debate makes it sound. The authors discover the meaning of several ossuaries found in several grave sites in the Jerusalem area. The artistic inscriptions are filled with Christian imagery, making them the earliest known Christian burials (between 50 and 70 AD).In a more risky proposition, they argue the found the bones of Jesus, his family, and possibly a child of his. While they rightly argue this does not really affect the whole concept of the resurrection, it does go against established Christian doctrine. While the authors attempt to argue for their proposition, they do so with references to the works of the gnostics and other spurious writings, leaving their arguments week and unconvincing. I first ran into this theory watching the movie by the same name. I seemed to get more out of the book (or perhaps I just paid closer attention).No specific answers but lots of interesting ideas. Since data always trumps theory I'll be interested to see what additional data turns up in the future. Very interesting archeology at work here. The authors claim that a tomb discovered in 1980 but inadequately studied and a nearby tomb which was discovered but never studied are tombs of the members of Jesus' family and early important Christians. An unusual confluence of names and nicknames which matches Biblical and extra-biblical sources fuels the claim that this tomb was that of Jesus' immediate family including Jesus, his brother, son(! ), mother and Mary Magdeline. A case is made for the well known ossuary inscribed "James son of Joseph, brother of Jesus" which toured in the early 2000s is claimed to be a issing ossuary from this very cave and some modern tests on the chemical composition of the patina, or discoloration with age, imply that this ossuary was in the same tomb as the Jesus ossuary.The theological implications are obvious. What does this mean for the Resurrection if Jesus' body has been laying in a tomb? Is the Maria found here the Virgin Mary who Roman Catholic doctrine claims was bodily assumed into Heaven. And is the Mariamene actually Mary Magdaline which a 4th Century non-canonical text tells us is her real name.I appreciated that the authors raised objections to their thesis and didn't hide behind bald claims to truth where there is in fact reasonable disagreement among experts. Points under disagreement were discussed fairly. I'm looking forward to reading more about this tomb from other points of view. I have followed the progress of biblical archeologyI found this book fascinating. Approaching it an open mind and coming to my own understanding of the facts is how I relate to these new discoveries. Just like I study and discuss in fellowship and bible study to apply the bible to my life. Everyone is permitted to form their own opinions. God gave us freewill. As I continue to learn I continue to understand every discovery and interpretation that God has made available to me. A wider and later version of the case presented in The Jesus Family Tomb that the Talpiot tomb discovered in 1980 is, in fact, the tomb of Jesus of Nazareth. A quick read, with some glossing over of things that were explained in more detail in The Jesus Family Tomb (e.g., patina analysis, name cluster statistics) to make room for new archaeological evidence from the Patio tomb. I enjoyed the writing and the story. And I am convinced that they have made a strong case for the Tomb being that of Jesus, and his family. I listened to this book on CD. It kept my attention. It seemed to describe very well the procedures used in investigating two tombs near Jerusalem. I did not at all agree with the conclusion: based on DNA analysis of bone chips from two ossuaries, a man and a woman buried in the "Jesus family tomb" were not related to each other, proving that Jesus married Mary Magdalene and did not rise from the dead. I feel like this book made very large leaps and assumptions in trying to support the authors hypothesis. I am not opposed to the idea of Jesus being married and fathering a child, as this would have been typical of Jewish men during his lifetime, and certainly not sinful in any way. However, I don't feel like this book provides enough evidence to support this claim, or the claim that they located the bones of Jesus himself. If nothing else it is an interesting read. This was a rather interesting book about finding thou grave of Jesus and his family. Lots of work went into the gathering of information but that same information was repeated over and over again. It was a good read just keep skiping the repeated parts and you will find some interesting information on the subject of the resurrection of Christ. The third bookI read from Tabor that has solidified my conviction that our Jesus story has been shaped by tradition and theology more than fact. It is an truly worthwhile book to test your faith in light of the facts. It'll change the way you read the biblical account or listen to sermons in your church. Interesting read... believable. I'm always skeptical about this kind-of stuff though. It's like finding a face on Mars.... Besides, what's proven today is swept aside for the actual truth tomorrow. I would be pretty cool to find out that the tomb your condo was built over was Jesus'! This book will give you something to think about. It certainly did that for me. I don't want to spoil anything, so I'll just say that this book did something I like: it looked at the historical side of Jesus and compared it to his portrayal in the Bible. Although I just finished reading this, I want to go back and take my time reading it again. Definitely gives you something to think about. I enjoy Dr. Tabor's work and Simcha Jacobovici is "The Naked Archeaologist!" - how can you lose? Although they're dealing with a subject many people of faith would immediately reject, the authors did a fantastic job of showing how their discoveries and interpretations could confirm the most staunch believers. It's an interesting read, a great book, and I would read it again. Excellent book; should be essential reading for all Christians! Very interesting & thought provoking. James D. Tabor Simcha Jacobovici - Chair of the Department of Religious Studies at the University of North Carolina at Charlotte where he has taught since 1989. He previously held positions at Ambassador College (1968-70 while a student), the University of Notre Dame (1979–85), and the College of William and Mary (1985–89).